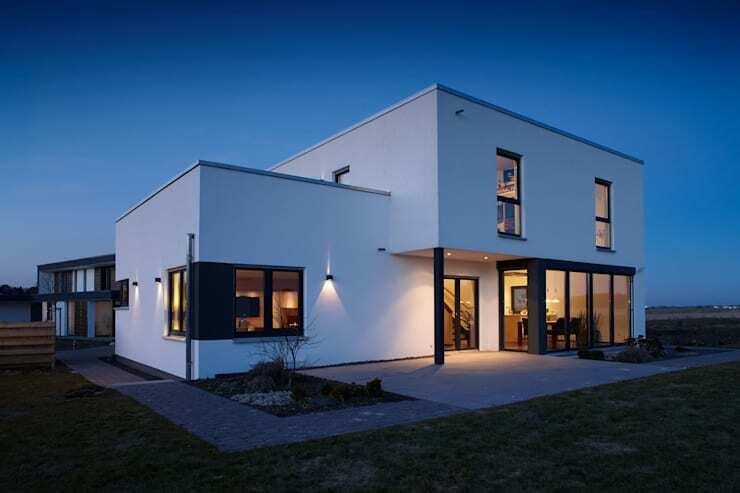 Today, the home builders at Fingerhaus GMBH in Frankenberg, Germany, bring you a modern and minimalistic home which embraces nature whole-heartedly. Simple yet elegant architecture, trendy designs, smart functionality and soothing, neutral colours make this residence a perfect sanctuary for a couple with a kid. The house offers ample space for indulging in outdoor pleasures and features numerous glass windows to let in the sun. Minimalist decor and sudden splashes of vibrant colours make this home a must see. 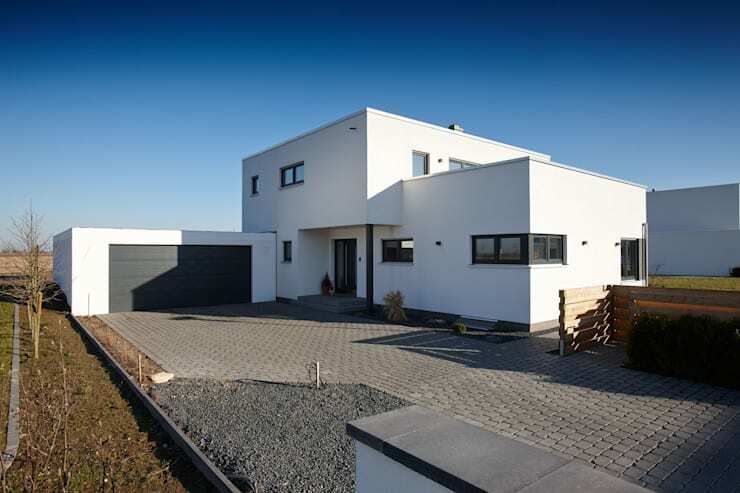 A driveway paved with grey stones take you to the neat garage of this house. 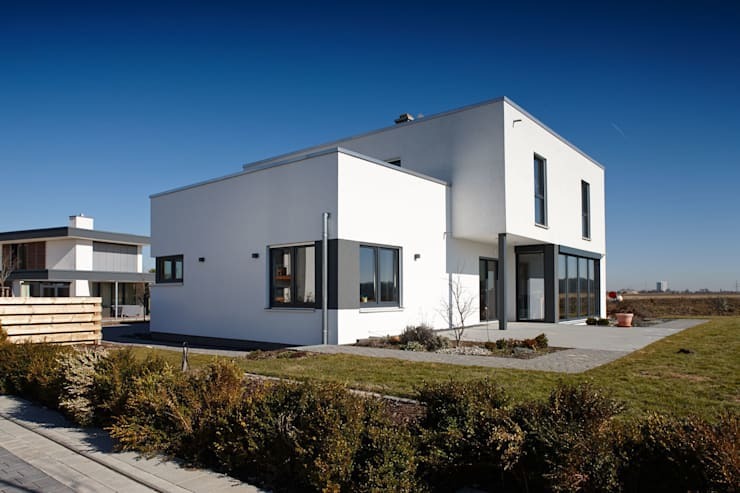 The house itself comprises of simple volumes and is done up in pristine white for a contemporary and bright look. Grey window frames add personality though. 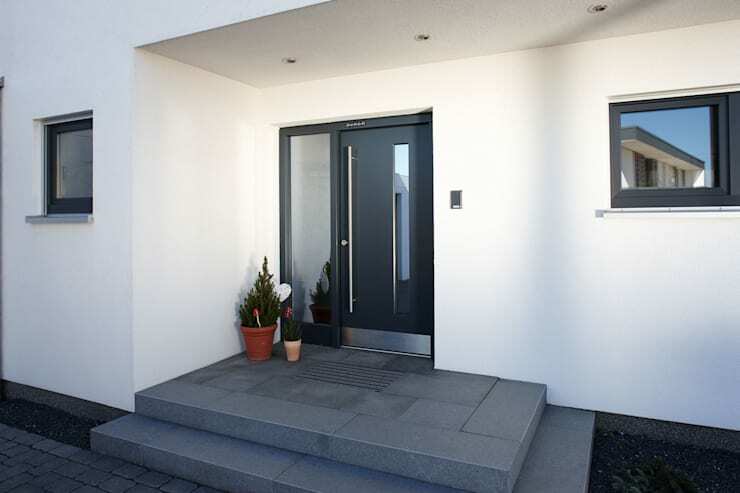 Sleek grey steps take you to the modern and chic entrance of the house. The grey door with its glass and chrome detailing looks inviting, while potted plants add freshness. 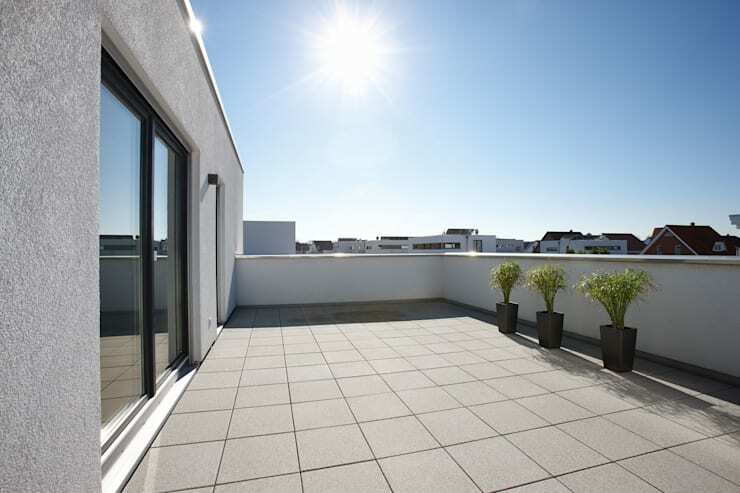 The sleek grey backyard patio is perfect for enjoying outdoor meals, barbeques and open air parties when the weather is good. Manicured green lawns and lively hedges make the backyard a delightful space for frolicking around or admiring nature. Numerous glass windows help the backside of the house to connect with the greenery as well. Lined with large grey tiles and decked with trendy potted greens, the first floor terrace is a sunny and airy space for lounging around or stargazing. Grey, white and light wooden tones come together in this simple yet elegant living room for a cosy experience. 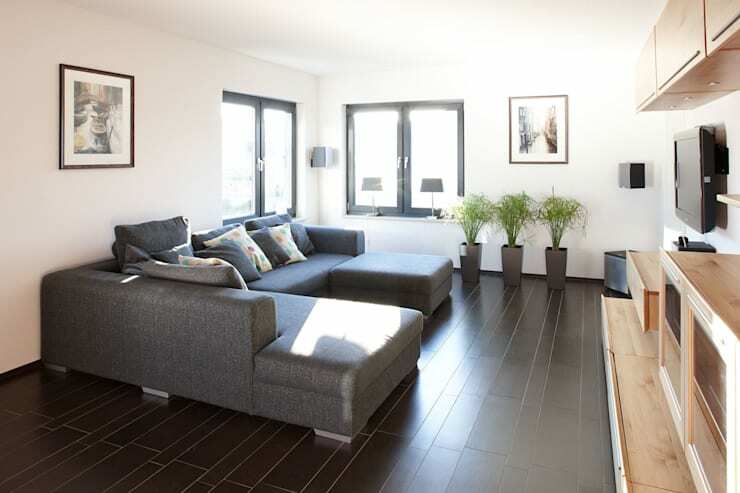 The stylish sofa complements the dark floor and planters, while the wooden TV unit is warm and practical. The dining area stays flooded with sunlight during the day, thanks to the floor to ceiling glass doors connecting it with the backyard. A sleek wooden table takes the centre stage here, and is surrounded by bold grey and red chairs for a modish feel. Stylish lamps and splashes of bright red nearby add spice as well. 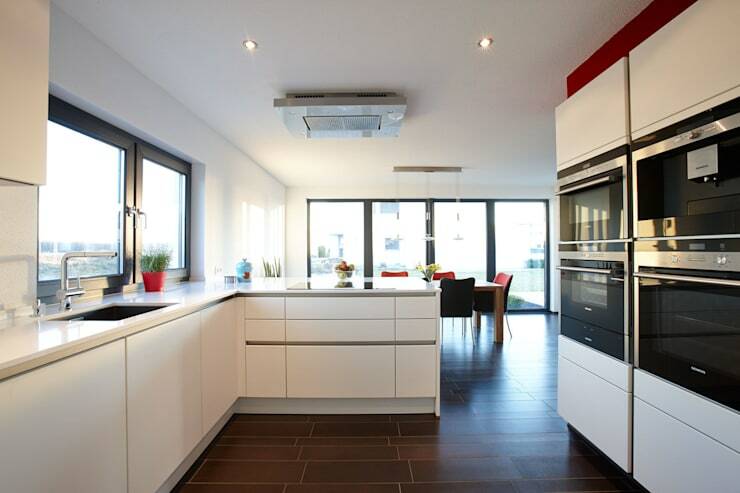 The spacious kitchen features warm brown flooring and smooth, glossy white cabinets for efficient storage. All modern appliances including ovens have been accommodated nicely, while a pair of glass windows brings in natural light. 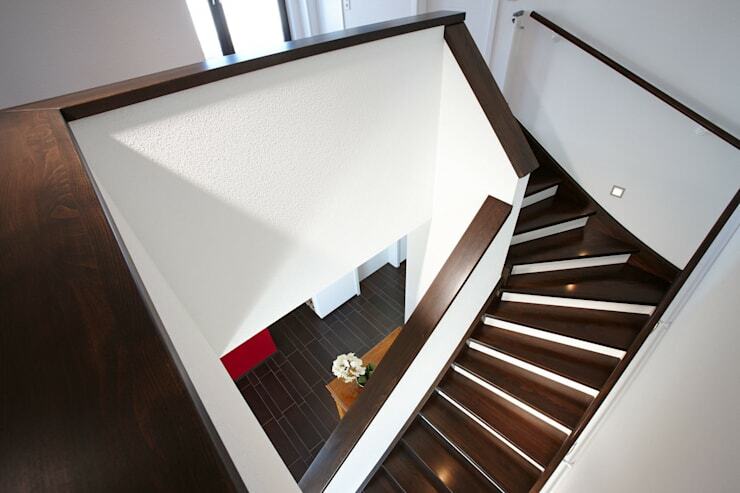 Dark and smooth wood has been paired with spotless white to create a fashionable and trendy staircase. Its sharp angles and smooth lines give it a classy look. Soothing and neutral hues dominate in the minimally furnished master bedroom for a serene atmosphere. A single potted plant offers freshness while the red carpeted floor lends vibrancy. 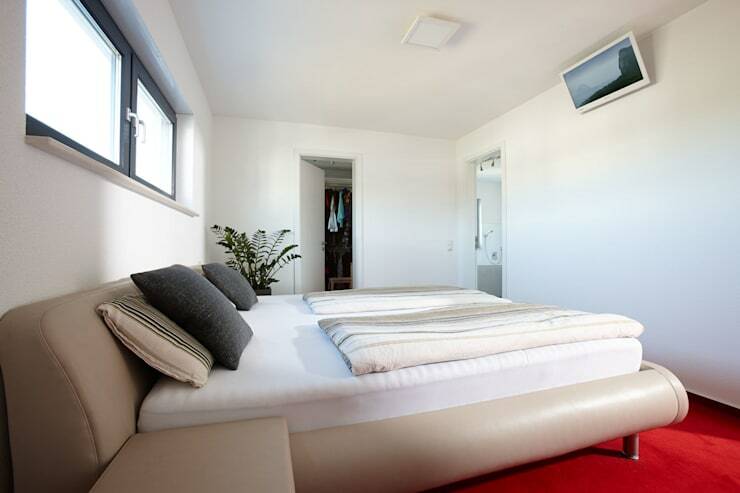 The green floor is like a breath of fresh air and youthfulness in the kid’s bedroom. Large glass windows keep the space bright and cheerful, while the wooden bunk bed accommodates a study station underneath it. 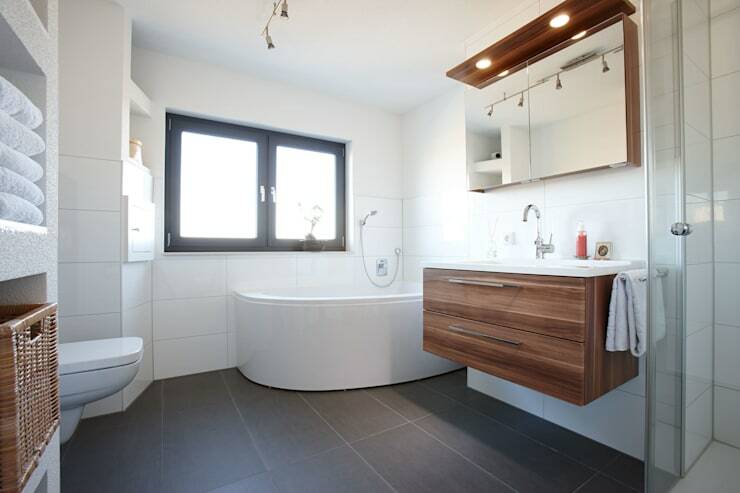 Like most other rooms, the spacious bathroom is a medley of white, grey and wooden tones too. Large white and grey tiles clad the floor and walls for an expansive feel, while in-built niches cater to storage needs. The curvy tub is a sensuous addition here. Check out another story for more ideas - The quaint country home with a modern spirit.